Need a reliable hosting solution to support your business? Get confused by the various types of web host? To help you find your web host, we wrote web host review based on our test result. You can learn their products features to see if they are the products you want. DigitalOcean is one of the popular hosting services. Is it reliable? What hosting products it offers? Is it affordable? Is there any hidden fee? You will find the answer in this DigitalOcean review. 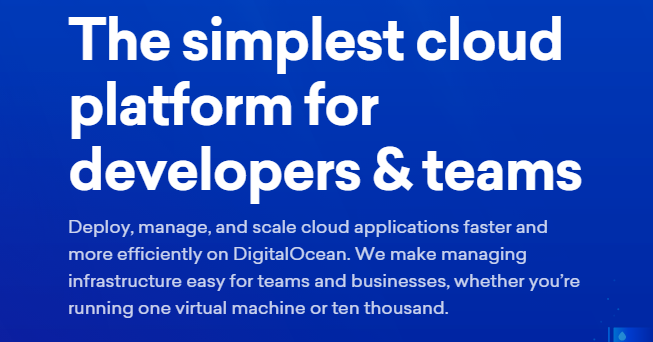 DigitalOcean is a solid hosting platform where developers can deploy, manage, and scale cloud applications faster and more efficiently. It has 12 datacenters across the world and offers excellent performance. That is very important to assist you to build a successful online presence. This platform uses awesome equipment to power your website and support your business with a 99.99% uptime SLA. Customers who look for quick and reliable solution to start their websites love this service because droplets can be deployed within one minute on this platform. It utilizes SSD and provides abundant bandwidth to achieve fast speed. DigitalOcean allows you to transfer the files on cloud servers the other facilities around the world freely. It supports team accounts to assist you to cooperate with your partners and get job done effectively. You can develop a project privately and keep your website or business safe with the private networking. As the number of your visitors grows, you are allowed to scale your website and business easily through versatile API. This platform allows global image transfer & KVM virtualization and offers floating IPs & DNS management to simplify developers’ job. This web host offers a helpful customer support and has an active user community. Useful information, tutorials and Q&As are available to help you develop your project. DigitalOcean offers flexible billing methods. Based on your need, you can choose to be billed hourly, or yearly. If you don’t use a full month of a service, you can choose to be billed hourly. In this way, you won’t be forced to pay for the full month. DigitalOcean is a reliable service that you can trust. DigitalOcean is fast growing cloud computing platform for developers. They call their servers as droplets. Their droplets come with add-on storage and security. You can scale your project with flexible resources any time as the droplets are resizable and SSD-based virtual machines. They are equipped with monitoring capabilities to run production applications easily. Their datacenters are logically located around the earth. You have the options to deploy your droplets in any of its datacenters for great connectivity and redundancy. It lets you transfer your droplets to another website within the same datacenter. You are able to control your domain’s DNS settings in every aspect conveniently with the full DNS management. To use this management, you only need to create a DNS record with your domain name and a chosen droplet. This web host lets you use conventional HTTP requests to manage your droplets. Likewise, its API enables you to deploy and manage droplets and resources in a simple and programmatic way. You can create multiple droplets, resize & reboot droplets and enable backups by using curl commands or the official API wrappers. There is no complicate installation and configuration to deploy a droplet. Simply choose a size and type you need and the web host will take care of the rest. DigitalOcean droplets start at $5.00 USD per month and $0.007 USD per hour. Are you looking for a simple way to deploy, orchestrate and manage container workloads in the cloud? DigitalOcean Kubernetes is a great choice as it is a leading open source platform that provides rapid deployment, isolation and security you need. The web host has been running large workloads on Kubernetes, and they have rich experience to help their customers do the job in an easier and advanced way. The platform is well designed by a team of experts, so you can deploy your container workloads without setting up everything from scratch. For best possible performance, it lets you deploy a private container registry to your cluster in seconds without configuration. The Kubernetes can be accessed through web UI, Kubernetes API, and kubectl. DigitalOcean provides Kubernetes master node services for free and offers cost-effective leading worker nodes. The cost is counted on usage of Droplet worker nodes, load balancers, and storage. The plans are flexible and scalable. It is possible to integrate block storage and load balancers to add worker pools of various Droplet sizes and expose your Kubernetes services with a public IP for best possible experience. We had pleasant experience with DigitalOcean Kubernetes during the test. Load Balancers are a highly available and fully-managed service that advanced developers need. They allow you to split incoming traffic between multiple backend servers across your infrastructure to decrease downtime and increase system reliability. It can handle HTTP, HTTPs, TCP and UDP traffics. DigitalOcean Load Balancers provides two different algorithms to distribute loads. They are round robin and least connections. Round robin selects the first server on its list for the first request and then the rest servers in order while least connections select servers with least connections. It is possible to scale horizontally with little and even no effect on the performance as the incoming traffic is balanced across your resources. You can provision in seconds and manage resources via the Control Panel or API easily. This product supports HTTP/2, so you can provide your clients better performance. DigitalOcean Load Balancers are billed hourly at $0.015 USD. There is no extra charge for bandwidth usage. They renew SSL certificates automatically for free. It is a great solution with high availability, flexibility and performance. Would you like to attach reliable and scalable SSD-based Block Storage to your server? You should work with DigitalOcean. It is a very convenient way to manage additional storage to your droplets. This web host offers volumes from 1GB up to 16TB. The volumes of provisioned Block Storage are an independent resource, so you can move them from one droplet to another within the same datacenter. It also is possible to increase the size of a volume without paying for processing power or memory that you don’t need. To expand droplet storage space and manage block storage volumes quickly, you are suggested to use conventional HTTP requests. You finish job like creating volumes, attaching, detaching, and retrieving volume information in this way. The web host stores your data on hardware isolated from your droplet to minimize the chance of data loss due to hardware failure. Your data is encrypted and transmitted to droplets through private networks. It keeps untouchable. With increasing demand, it lets you attach additional storage volumes to your droplets instantly. DigitalOcean Block Storage costs $0.10/GB per month. The price is transparent. You can save time in complicated formulas for suitable solution with best value. Simply pay the provisioned capacity. You will find it is a pretty effective way to do provision your droplets. DigitalOcean has eight datacenters distributed throughout the world in the US, UK, Canada, Germany, the Netherlands, Singapore and India. For the best possible performance, we suggest you choose datacenter nearest to your clients, visitors or users. The closer server will allow users to load the page and access your website at faster speed. DigitalOcean offers advanced equipment, SSD-based virtual machines and scalable SSD-based Block Storage, so it has confidence in promising 99.99% uptime. According to its community, users received fair compensation for downtime. The fast speed and high uptime will provide your client satisfied experience and give search engines great impression. Your website, blog or products will be ranked high among the search results. Visitors can find them easily. You will be able to run your business successfully with a great reputation. 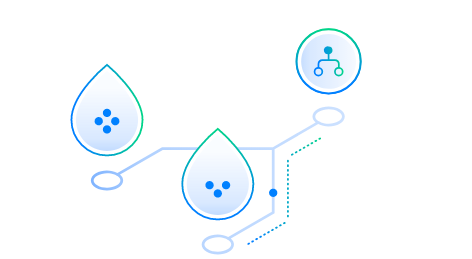 DigitalOcean offers solid droplets with clean design and simplicity. Droplets are easy to deployed. The web host provides computing in the cloud. There is no complicated configuration process to go through and you don’t need special skill to set up your cloud services. The well-designed control panel lets you manage your resources and every aspect of hosting service effectively. Even beginners can deploy a fast cloud server from control panel or scale the droplet via API easily. As it offers pre-built applications, you can skip installation and configuration to deploy your code. Their pre-built images support Node.js, Ruby on Rails, MongoDB, Docker, and many more. The service makes it possible to allocate more resources with a single click. If you meet problem when using the service, you can contact the tech support anytime. Customer support is very important because you need instant help when your websites run into issues. Especially for users who are not so good at hosting service, they rely on the customer support to get their website work again. DigitalOcean delivers support via a ticket system. You will need to submit a ticket and wait for a solution. There is no live chat or phone support, so you can’t communicate with the experts directly or resolve your problem timely. That is bad for beginners. If the website is off for some reasons, they have to leave the problem and wait for solution from the support team. Experienced users can find useful information on their community. There are a large number of tutorials on the official websites. They create new guides and update old ones actively to make developer’s life easier. They also organize meetup to let developers share resources, learn & form discussions around cloud and DevOps topics in different cities. That is a great opportunity to learn and improve. If you need answers to commonly seen questions, there is Q&A page. You will find much more helpful information on their community, but you need to do it yourself to fix the issue. DigitalOcean customer support is good. It can be perfect if there is live chat and phone support. DigitalOcean delivers reliable service to help both individual developers and large enterprises. It simplifies the process to build a professional website to let developers put more effort on developing their projects. It is very easy to start to work with this web host. You need to choose the size of your droplet like the amount of RAM and storage. Next, add block storage so as to attach your droplets with additional storage volumes. Then, select a datacenter nearest to your website and clients. After that, add SSH keys for additional security. In the end, finalize and create your droplet. This service is resizable, so you can scale your business anytime you need. It can be done quickly with less effect on your performance. DigitalOcean offers real-time monitoring. From the control panel, you can track CPU usage, network usage, disk usage, disk I/O and memory usage to ensure best performance. If you are too busy to monitor, you can set up alerts for certain issues. For example, you will receive alert via Slack or email if you set up alert for CPU usage exceeding a threshold. The customer support is available for all customers if you need help. It offers affordable prices. You won’t break the bank for creating an awesome online presence. It starts at $5.00 USD per month. You can build an excellent website or project with high performance and uptime with less effort on your side with DigitalOcean.